In anticipation of the upcoming 2012 Wine Bloggers’ Conference later this week the editors at Palate Press: The online wine magazine have gathered several different perspectives on wine bloggers. This week we will be running those perspectives, and taking a look at how wine bloggers are viewed by the rest of the world. As the conference will take place in Portland, OR this year, we turned to winemakers from the Willamette Valley for their perspective on wine bloggers. 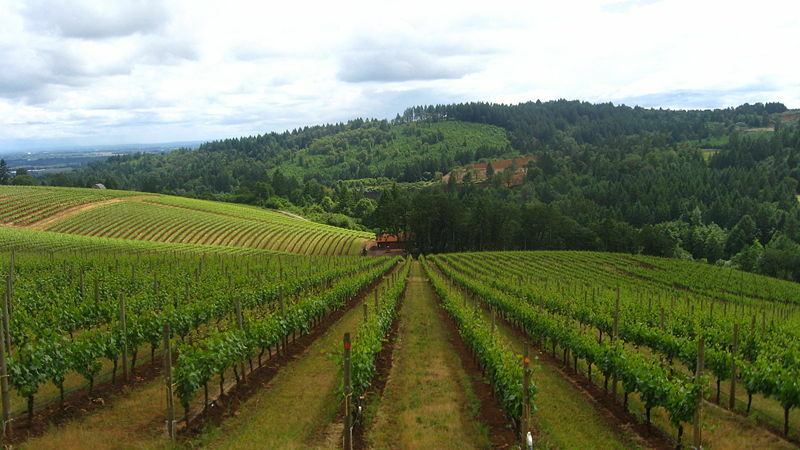 Here is what three Willamette Valley vintners had to say. What has been your experience with wine bloggers? Trudy Kramer, Kramer Vineyards: Well, my daughter is engaged to one. And they got [a well known local writer] to notice us. It all began with a little dinner at our house. Don Hagge, Vidon Vineyard: None that I remember. Lynn Penner-Ash, Penner-Ash Wine Cellars: Minimal. How do you feel wine bloggers have supported your business? TK: The local ones come to some of our events. Some have worked harvest or other times here—like when you [Ryan Reichert] did the video of the sparkling disgorging. That was way cool! I enjoy having them come and experience the real work side of winemaking. There is so much to learn and share. And when they do come, they taste the wines. Not many of the old time reviewers actually come to the wineries. They just stay in their offices. I think that is a big mistake. DH: Not at all that I’m aware of. LPA: Positive comments are always nice. Have you noticed any direct correlation in any wine sales, or increased visits to your winery/tasting room? TK: Not sure about this. I think this whole area is so new. We are doing a survey in our tasting room (finding out how people came to be here) and wine blogger was not on the list so I just added it. LPA: No, I’m not sure how we would be able to track that. How do you feel wine bloggers compare with more traditional wine writers? TK: They are definitely the younger generation with a refreshing viewpoint. I worry though that they don’t spit enough. Professionals always spit. Judges spit. I spit. If you don’t your analysis is flawed. You can’t taste or smell flaws in the wine. LPA: I don’t think they do as thorough research on topics, a lot of time comments we’ve read have inaccuracies due to the spontaneity of the blog. What, if anything, do you think would make working with wine bloggers more beneficial to your brand? TK: Not sure about this because we don’t have wide distribution. Only in Oregon. And not many places even here. I have enjoyed getting to know the wine bloggers in this area and people who know them. It is like a little community of wine lovers which is really nice. We have made some friends and introduced people to our wines because of the internet connections, Twitter and Facebook are two areas that have been beneficial. DH: Nothing I can think of. LPA: Reaching a different demographic more tuned into the electronic and quick commentary. If you are a winemaker in Oregon, or elsewhere, we invite you to leave your own replies to these questions in the comments for this post. hi,i find your articles helpful. i wish we could have such org here in my place. I’d be curious how many of those organizations interviewed did any research on the 300-400 bloggers coming to OR at the end of the week for WBC. Engagement is a two way street. Merely saying you haven’t had many or any bloggers engage you is only answering half the question. I hope some wineries can answer these questions very differently in a week. If not, it would be a huge lost opportunity. I second Jason’s comment. Saw that happen to some extent in Walla Walla in 2010, that seemed a huge wasted opportunity for the vintners and I really hope OR doesn’t follow that path. Agreed that this is a two-way street, but I think that that means more than wineries doing their research and reaching out to new media. One of the winemakers above mentioned professionalism which, I think, is a significant issue for WBC. What if winemakers reach out and, instead of finding a group of sober and focused professionals, find what seems to be a private drinking party? Clearly not reflective of everyone’s behavior at the conference, but I fear that a misbehaved minority could give the wrong impression about the group as a whole. I hope that the conference attendees will use the opportunity to present themselves as media professionals and that the area wineries will use the opportunity to receive them as such, both. I agree with your sentiments, Jason. Engagement is a 2-way street. WBC is a great opportunity for both winemakers and bloggers to develop long-lasting relationships that benefit all. I was just this morning talking with a local (OR) winery owner and this topic. While she would have loved to have participated in WBC, the smaller wineries are completely priced out of participating. (She is, however, donating 2 bottles to Night of Many Bottles, but only because I can deliver them for her.) Small wineries also are the wineries who likely don’t have the bandwidth to learn about the blogging community, find the bloggers who are good fits for their brand, and nurture relationships with them. No matter how important you think this effort might be, it will always be trumped by direct product-oriented tasks. There often also is a (at least perceived) sense of entitlement among some bloggers who show up in tasting rooms, expect a free tasting and an industry discount, but don’t have any sense of quid pro quo. Often these bloggers have little readership. So it goes both ways. Wineries could better understand the value of bloggers, and bloggers could better understand wineries and their constraints. With respect to the post above, I’d really like to see a much larger sample size and greater depth. But it’s a great way to start some dialog. Props, Ryan. Hi Karin – thanks for your comment. Outside of compiling feedback, I’ve really got to step outside of this; hence why I didn’t include any of my opinion in this. However, my apologies that I didn’t have more to offer. I emailed 20+ winery owners and winemakers, and got three replies. I don’t think that says “we don’t care” but I’m thinking folks a) didn’t know what to say, or b) didn’t have time to reply. In short, I worked with what I had. And many thanks to the three responses I received. Three producers that I respect, and I think whether folks liked their comments or not, they are telling of the work that needs to be done. I agree with many of the comments here, and certainly did not intend this to be a “let’s gang up on winemakers” deal. Bloggers do have the lion’s share of the work to do in proving themselves on a whole though, so that producers are able to see more impact—if that is the point. Some bloggers I’m certain are just interested in posting for themselves and enjoy wine … they aren’t the ones typically that wineries are going to look to as a media outlet. That said, I would garner that many of the attendees this weekend would not qualify themselves in that camp. I suspect everyone in attendance is interested in helping promote wineries, and helping their audience learn more about and enjoy wine. I was discussing with my partner last night, that many of the issues with blogging and brands when it comes to wineries—especially those here in Oregon—is in line with your comments. Big brands (and wineries in turn) can afford to have staff that engage media and handle marketing; they can spend time and money to make the effort to do outreach. For smaller producers this is often so much harder because they’re not marketing people, or PR people, etc. And only so much fits on any one person’s plate (or in their budget). Not to say some small brands have not leveraged bloggers in a very big way; it just isn’t the same for everyone. Again, hopefully we can get some more responses from winemakers or winery owners from Oregon (and beyond) here in the comments. Cheers! Ryan, my comment about sample size wasn’t criticize but an honest interest in the topic. My apologies if that wasn’t clear. Important topic! I agree wholeheartedly with Trudy (go, Kramer!) that bloggers are your -gateway media-. Working in NW wine marketing for our Ore., Id.,and Wash., wineries I find that bloggers are the “somm buddies,” the competition judges, the tastemakers and are far more willing to come out to our properties and really get a sense of what we’re about. My faves are those who go deep, write with joy, passion and “sans snark,” and those who follow FTC protocol to disclaim they were sampled. If there is a hand sticking out or sense of entitlement, run! I wish your “DH” subject was a little more effusive, just sayin’. Cheers! Don Hagge and Lynn Penner-Ash don’t seem to care about bloggers, based on their responses. Time will tell if that strategy works or not. That said, a brand like Penner-Ash, which has large production (by OR standards) and nationwide distribution may not have to care about wine bloggers *yet*. If they sell out every vintage doing what they’re doing now, this new channel might not be worth their time. Her comment about inaccuracies is indeed something the blogging world needs to tackle more often. Agreed- it doesn’t seem like the two of them care. I’m wondering if it’s a generational gap or a lack of sufficient evidence. It’s hard to track actual revenues from the efforts of wine bloggers; it’s simply the nature of the business. Can we positively influence wine sales and brand recognition? Yes, I think we absolutely can. But it’s the difficulty in quantifying the level of influence that I think leads wineries to often focus all their efforts on more traditional methods (like the “big boys” Alan mentions below). Matt – my only thought here is that you can track a lot … even brand sentiment to a point. You’re not going to ever know every single customer’s exact path and touchpoint through your sales funnel, but you can get a good idea of what a successful sales path is. It’s a matter of having the time, resources, money, and know-how to do it though, and that’s what a lot of wineries (and many small businesses in any industry for that matter) lack. As I winery media consultant — All Media Winery Solutions — and a longtime wine journalist, the first thing I ask prospective clients is: So, where would you like to concentrate your energies re: getting your brand out to the media? Invariably, the answers are the same: Spectator, Enthusiast, NY Times, WSJ. Very well, I reply, but if that’s the totality of your vision, you’ll be disappointed. So I offer, “When you travel to the various markets around the country, which you invariably do, often, how about if I set you up with several wine media members in Philly, and in Cleveland, and oh, did I mention Memphis? If all you’re interested in are the “big boys” (see the usual suspects above), I’m not the agency you want; and oh by the way, you’re going to miss a great opportunity. In those cities that you’ll be traveling to, I will put you face-to-face with not only the daily newspaper wine columnist in that market, I’ll also put together a lunch or dinner with the guy who is making a name for himself with his and her blog; and if we’re lucky, I’ll get you on Radio-WINO in the town where you’re working so hard to get your wines placed. Don’t bypass the local markets or the bloggers. They are becoming just as important, and in many cases, more integral to reaching critical mass with your brand. No surprises here, and one of the reasons I gave up wine marketing consulting, its like pushing a rock up hill. Its an industry that has broad misunderstanding of long term branding, PR, marketing value. Its a long term business, you build brick by brick, not when you feel like it. As someone who started as a blogger and now 3rd vintage commercial Micro winery, my perspective has changed in some ways, but unwavering in others. Its not just blogger community value, and the usual “show me the money’ statement. Many wineries that spent 50K also can’t tell you their ROI on that…how do you measure it? Even if you use tracking tools, codes, etc there is no foolproof way to follow a sale from cradle to grave, view to shopping cart. Most wineries can’t even tell you the demographics who visited their tasting room or what they bought, let alone track sales from print writers or bloggers. Big wineries, like Penner Ash, frankly CAN afford the sample budget, and should be sending out to key markets. Little guys, its a harder, just affording to send out and pay $50 shipping to the east hurts me, and eliminated the profits for a case sold. Let alone sending wine from small lots with very high costs. All the margins favor the big volume guys, not the tiny artisans. Yet I see the little guys paying more attention often. Bloggers are also buyers btw, on occasion. Before I took every last penny to start my label, I spent 10-20k a year on wine. Many of my wine club members are bloggers. Sure I give them better than normal discounts as an extra perk, but its better than BTG or wholesale margins. On the flip side, it can be a challenge to wade through the multitude of bloggers and their value. The vast majority have small followings and barely move the needle, and much of their following can be all industry. A Twitter following is not the same thing as a consumer readership. A decent number don’t really have a lot of depth in knowledge. All the more reason for big brands to send everyday consumer wine to this crowd. I’ll be the first to tell you I rarely right for the Safeway consumer anymore, nor make wines for them. I HAVE seen sales and wine club signups from blogs. More importantly though, is the cumulative AFFECT these have on BRANDING – your name appearing over and over again. I signed up a wine club member, who never tasted, because he kept seeing Instagram photos (which I don’t use) of the label showing up amongst trusted palates. A blog article may not move sales. A major print publication by the way, doesn’t always either. That doesn’t make them any less valuable for market awareness, branding impressions, and an excuse to share with the world when someone says something nice about you. Bravo Kramer. Keep on Trucking, Believing, Trying. William has a big chunk of the story spot on. As a guy who used a blog and podcast to get my start in the wine business I’ve seen both the blogging side and now as a winery owner, the winery side. I didn’t spend my time while writing a blog complaining that I wasn’t as valued as Robert Parker. But then again I wasn’t doing reviews for the most part. Had I been asked the questions above I would have been very pro-blogger but not because a random mention sells wine but because I have met some of our most loyal customers and evangelists through the blogging and social media circles we maintain. If you are not welcomed at a winery then you needn’t complain that they don’t get it. Just put your focus elsewhere. Bloggers are much more likely to discover new brands before the glossies. That’s a place to focus and if you can stop writing tasting notes and start telling stories, that’s what I’ve seen bring people to us. So don’t be too hard on stupid winery owners. We’re told by pretty much every media channel that we’re to dumb and slow to do it right but when you ask the pros who is doing it right they rarely can provide a solid case study. (at least one that doesn’t involve a major brand with deep pockets) To me that simply means we’re in a spot in history where things are such in flux that solid models are not quite established. And this may be a permanent state considering the micro sliced channels that people use to get information. When I was writing the blog before NPR picked up the podcast for alt.npr it was pretty clear that the small boutique wineries I wanted to taste and work with had little time or budget for projects and the big guys I didn’t care about truly didn’t need my attention, and they still don’t. As a person who enjoys wine I have discovered many great wineries via Twitter. I think that I would have stayed within my own area and never ventured out if it had not been for social media. I have watched certain wine chats on Twitter that have sparked an interest to me and I have immediately ordered the wine they were talking about online. If a winemaker/winery engages with me on social media I will buy a bottle or a few of their wine. It gives us something to talk about.